Doughnuts and coffee will be provided, though. Rightroots has a lot of balls. They’re like the McCain callers who hit me sometime in 2005, it seems, demanding my support or I’d get a Clinton presidency. Now, this Rightroots band has started the F7 program, seeking pledges that Republicans will send money to whoever is the candidate on February 7, 2008. Or else I get Clinton or Obama. Setting aside the fact that there won’t actually be a candidate until the convention this summer, but I don’t care about any of the remaining candidate for the candidacy. This is the best our remaining candidates can offer the bulk of conservatives. That they’re not Clinton or Obama. To me, either one is as bad–or worse–on domestic policies and slightly better on foreign policies in that I don’t think they’ll gut the military. That’s what has me “sold” on one of these Republicans in the White House in 2008. That’s hardly a ringing endorsement or a call to action for me. I won’t sit out the election, but I’m not going to jump on the Not Clinton or Not Obama bandwagon with any sort of fervor. In 2000, I sent money and I volunteered for the candidate for president; in 2004, I sent money. But I have quite enough reservations about the remaining candidates. I am sure enough not going to waste my money or time in support of a candidate or a party with which I no longer agree. The Rightroots and the Republicans better learn that its previous constituency was not composed of fall-in-line simpletons. Here’s my pledge: Not on damn dollar or hour. Again. Wow, is this book really 10 years old? Man, I read the original book, The Rants only….12 years ago, I guess. Funny how those years condense in memory. I’m reading another book whose predecessor I read in my old house, probably 3 years ago, and that doesn’t seem so far back. Regardless, let’s get to the book in hand. It collects Dennis Miller’s monologues from his old HBO show which he got right after he left Saturday Night Live. All those years ago. They’re seasoned with his allusions, which you get enough of to think yourself smart when you get them. He takes on the normal topical topics, like kids these days (which are now kids those days and adults now), politics, government, and relationships. The titles are broad and the topic matter, too, is broad, and somehow, it saddens me and comforts me that the rants could hold up today, a decade later. Particularly if you just change the name “Clinton” to “Clinton.” We haven’t come very far in this decade, but we haven’t gotten much worse. Additionally, it’s odd to note that Dennis Miller, before 2001, sounds more like an intelligent Bill Maher politically than he does now. He says, I think, that he changed in 2001. I would say so. Good, interesting reading worth a look. A Tax That Doesn’t Sunset? You Don’t Say! The amount of sales-tax revenue distributed in 2007 to the Miller Park stadium district increased by only 1.8% over the previous year, raising new concerns the five-county tax will not be retired as hoped in 2014. Which raises the distinct possibility that the stadium will be empty because the Milwaukee Brewers become the San Antonio Migrants or the stadium will be replaced to keep the Brewers in town before the sales tax is retired. But you’re telling me that taxes with expiration dates are more likely to stick around than tax cuts with expiration dates? This is a stunning turn of events, indeed! The next time I update my sidebar, he’ll be back on it. Also, I’ll remove the dead man, the dead candidate, and the dead paper link. After all, dead men fill in no scanatron forms with number two pencils. Here are 18 Stunning Bridges From Around The World. As you might know, gentle reader, I am a great John D. MacDonald fan, and someday I hope to own all of these paperback originals. This one, written in the middle 1950s, deals with a bucolic Florida town near Tampa that has an old doctor who grew rich from land sales but kept the money, in cash, in his fortress like home. Word gets out, and some out of town hitters come looking for it at the same time as distant shirt-tail relations show up to sponge a bit and the niece-by-marriage hatches a plot to have the man committed. The book switches points of view and really develops the individual characters in it. It seems slowly, almost, but it’s not; the book runs only 191 pages and really ramps up to a good climax as the individual storylines come to a focal point. MacDonald does this well in his paperback originals, some of which I’ve already reviewed in this space (use the search bar, I’m too lazy to do it for you). This book is a good one in the set, and I’m eager for the next. Which will probably be in a couple of weeks. A joke on Deb’s site that I shared easily with my mother and uneasily with my wife. It doesn’t have talking dogs, but it’s funny never the less. That should help make your design work go a little smoothly. Press your face against the screen. Can’t you just smell the mimeograph ink? Additionally, I post for your amusement, the beginning of the source code for a game entitled Spies. No non-disclosure agreement required! 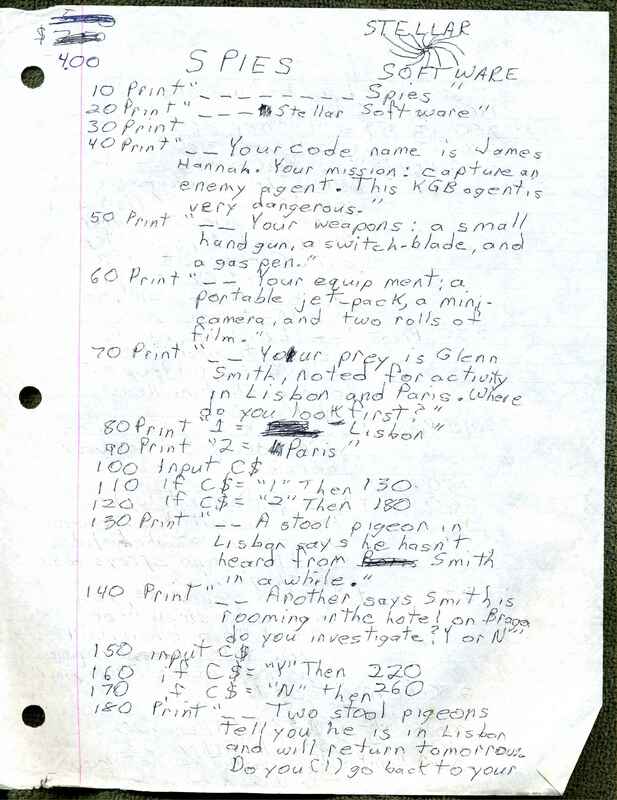 It’s not that we had to write the code by hand and put it through an optical scanner, you damn kids, it’s that we in middle school only got access to a computer during seventh hour but spent much of the other six handwriting the code because it was so exciting. 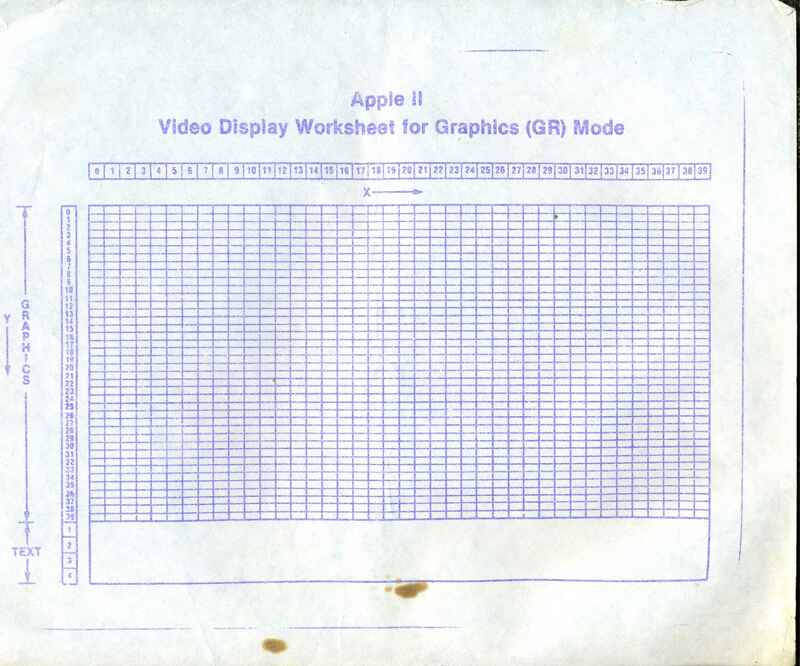 And just so you know, the schools had the Apples, but my first computer was a Commodore, so that’s where I turned off the path of geekanati and into the real world. After the opening, Weiland nearly lost the entire audience during the usual meet-and-greet interlude when he stuck his foot in his mouth and addressed the crowd “Chi . . . CA . . . go . . . ” He was met with a barrage of boos. Yeah, if you’re playing a crowd in Milwaukee, you probably cannot go more wrong. The underlying reasons for the skyrocketing prices are complicated, with roots in places as far away as Australia and as close as a newly planted acre of corn. Rising fuel prices are a main cause, but other factors, particularly a new government mandate for more corn-derived ethanol, are playing a role, too. “It takes a lot of bad things happening at the same time, for the prices to go where they have,” said Pat Westhoff, co-director of the Food and Agricultural Research Policy Institute at the University of Missouri-Columbia. We’ve got government mandates saying food should be burned as fuel and government prohibitions restricting nuclear power, new drilling, new pipelines, and new refining capacity. But mandates are made in the passive voice, and these things just happen. One man is described as heavy set and between 5’6″ and 5’9″ tall wearing a dark hooded jacket with black baggie pants and a sock cap. The other has a lighter complexion with dread locks or a pony tail wearing a light gray hooded jacket. 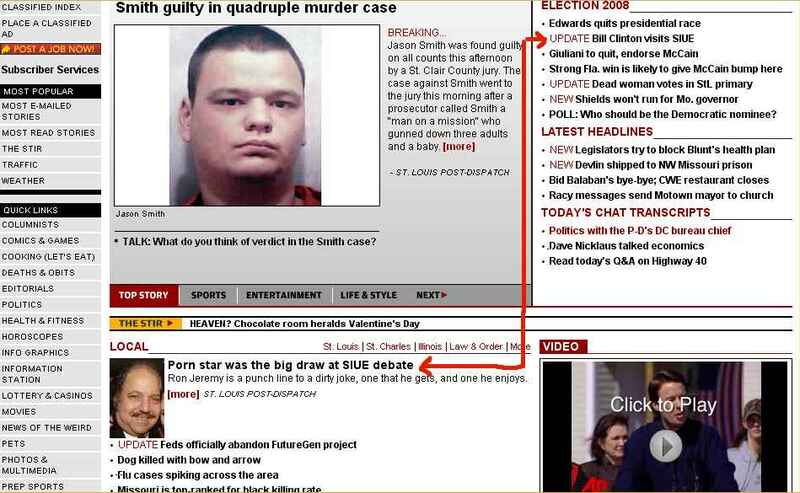 The inclusion of a lighter complexion makes me wonder if, perhaps, the high-minded St. Louis Post-Dispatch has left out a vital part of the description: the race of the perpetrators. Because if they were white rednecks, that would mean that the lighter complexion refers to an albino or a mere pink neck. This play details two Jewish brothers’ brief stay with their grandmother and aunt in Yonkers during World War II. The grandmother is of old German dictatorial stock, the aunt is daft, the father (who leaves the boys with his mother while he earns some money to repay a debt to a loan shark) is weak, and the uncle is a bag man for the mob who’s on the run. The boys, needless to say, aren’t thrilled and aren’t sure how to survive in this environment. Not one of the Simon plays that I’ve found that speaks to me; I guess if I would have been Jewish in New York in World War II, it would have been more meaningful to me. It’s not a bad read, but I don’t know that the play is as driving and forward moving as a play ought to be. What, he’s not actually saying he’s started a civil war and an armed conflict to turn the Missouri Republic to the Missouri Empire? Those whacky politicians and their misunderstood metaphors! The mother, Amy Fujarte, was in the house alone at the time of the fire, Svetanics said, and was taken to an area hospital and treated for smoke inhalation. Nickie Bequette, who lives across the street in the 9700 block of South Broadway, said she was enjoying a morning cup of coffee when she looked out a window and saw smoke pouring from the house and the mother escape out a side door with two children. Which was it? Obviously, it wasn’t worth the reporter’s shoe leather. Charter Communications is offering apologies —and $50 credits — to customers who lost e-mails when 14,000 accounts were cleared out by mistake. Charter was doing routine maintenance Monday, clearing out old, unused accounts from the system, when the 14,000 active accounts were accidentally cleared as well, according to Anita Lamont, a spokeswoman for the Town and Country-based company. About 1,000 of those accounts were in Missouri and about 300 were in Illinois, she said. The accounts should still be open to customers, but everything in them was deleted — and is gone for good. Also, Charter tips a bit of its internal process regarding backups for client data. The part it reveals is the text “Why bother?” The font in which they wrote that particular piece of internal documentation remains secret, covered by an NDA no doubt.